Ever one for nice surprises, Nintendo released its new, free update for Super Mario Odyssey without warning yesterday, delighting Switch owners everywhere with more costumes, photo mode filters, and a new game mode called Luigi's Balloon World. As the name suggests, this is very much a Luigi focused adventure, where players can find Mario's taller, less successful twin across the various Kingdoms of Odyssey's game world, and talk to him to try out a series of challenges. The "Hide It" challenge lets you hide a balloon somewhere in the kingdom for other players to try and find, while "Find It" tasks you with locating a balloon that someone else has tucked away somewhere. Being good at both allows you move up in the online leaderboards, and Balloon World is also a great way to earn coins if you're still saving up for that ridiculously expensive Skeleton Outfit. As expected, Nintendo has filled the update with classic Ninty-esque details and easter eggs, and Switch owners have already taken to Twitter to show off some of the best things about Luigi's Balloon World. Warning: most of them prove that Luigi has always secretly been best Italian plumber this whole time. 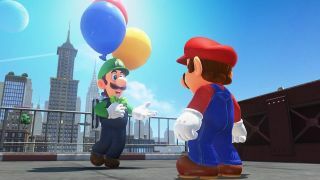 Despite the brotherly love, players are still having fun asserting Mario's dominance as the protagonist of the game, even if poor old Luigi looks visibly distressed by his brother's obsession with fame. For coin hunters out there, Luigi's Balloon World is a dream come true, offering the chance to quickly earn dozens of the little gold fellas without much in the way of risk. Anyone with a Nintendo Switch console and a copy of Super Mario Odyssey can get going on Luigi's Balloon World as of right now, so boot it up as soon as you can to start downloading the update, then let us know your thoughts about it in the comments below.